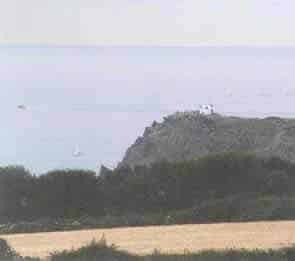 Local information: 2 self-catering holiday cottages located in East Prawle, Devon. Gara Rock beach at low tide. You can walk along the coast or go by car. 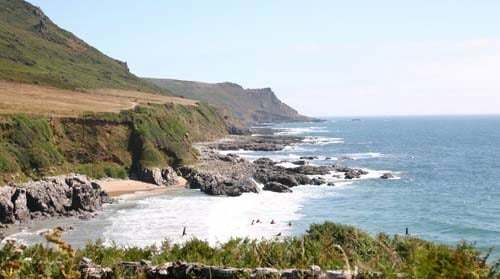 Beach and coastline within walking distance of our holiday cottages in East Prawle. Alternatively there are beaches that you can drive to with small children or people who don’t enjoy walking. One of the loveliest beaches, Gara is west of the cottage. You can easily walk there, or take a car and park in the field and walk down. There is a building at the top which used to be Gara Rock Hotel and is now accommodation and a good restaurant. The nearest beach, Horsley, has wonderful rock pools with crabs, shrimps and anenomes. Good for bathing or on colder days for rock-pooling, collecting shells, paddling and climbing. A short walk down with steep adventure for children, or easier alternative for some, the beach has endless opportunities and changes of mood and tide. One of the most popular beaches for families with small children, Lannacombe has access by car. It is also popular with surfers. The beaches are very special and varied. 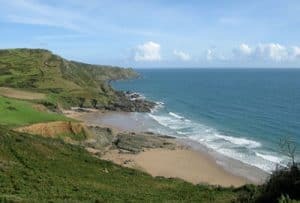 Macely has wonderful sand, Moorsands is the most private, Horseley has the best flora and fauna, Mattiscombe the best rocks, Lannacombe the best surfing and rocks, Mill Bay is perfect for toddlers and small children while Gara makes an ideal beach to walk to and have a drink or a cream tea at the hotel. Doctors: 01548 580214 Health Centre is at Orchard Way, Chillington, opposite the post office. Note: Ring this number also for out-of-hours attention. There is a clinic in Totnes which is open 8am to 6pm Sundays and Bank holidays. Shopping generally: the nearest town is Kingsbridge. There is a shop in the village and for most extras you will find Kingsbridge a good extra source. Tescos and Riverford farm will deliver. Salcombe is good for clothes and trinkets but for food, Kingsbridge is better. Tesco’s: Tesco’s now offer a delivery to East Prawle – make your orders in the normal way. The postcode for Foss Cottage is TQ7 2DA and for Sea Rocket Cottage it is TQ7 2BY. Local information: As well as the Pig’s Nose Inn, East Prawle has the Piglet Stores run by Viv and Chris Lally, for most of what you’ll need, with Piglet’s Cafe for delicious homemade cakes and snacks in the summer, as well as early evening meals. This saves shopping in Kingsbridge as they have plenty of fresh food including bread. Usually closed in the winter. There are plenty of camping locations around the village. Leaflets about Horse Riding, Sailing, kayaking, places to visit on wet days is contained in the myriad leaflets in the cottages. There is sailing at Salcombe. Dartmoor is three quarters of an hour’s drive and there are castles and country houses also within reach in wet weather, as is the Dart Valley Railway. South Devon is a gourmet area with wonderful fish in Kingsbridge and from the village; delicacies of every kind can be bought on the way to the cottages, from the Riverford Farm shop at Staverton (near Totnes) and exquisite fresh vegetables from gardeners in the village. The New Angel at Dartmouth is rated one of the best restaurants in England. Electronics: Sea Rocket Cottage now has Wi-Fi. Foss Cottage is an electronics-free zone for a super-relaxing holiday. The village has a telephone and mobile signal and the pub has free wifi. 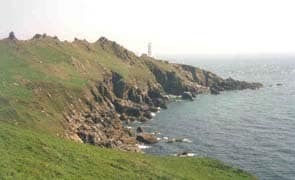 Prawle Point with Signal Station is manned from morning to night keeping watch on the sea from Start Point to Salcombe. To make a reservation, book now!